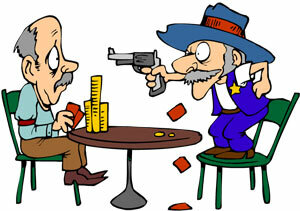 Aggression, in poker, can be defined as the skill of making the most out of a good hand. The reason it’s an important aspect to have in your game, is that you’re probably going to spend most of your time playing the best hands you have. Poker is as much about maximizing your wins when you have the best hand as it is losing the least amount of money when you have the worst hand, and you need to know how to make the most of it when it comes. You’re chips will be steadily wasting away as a result of the forced blinds you are made to put into the pot each round, so you need to have the aggression in your game to make the most out of a good hand. So what do you have to do to be aggressive? It’s all about betting, raising, and sometimes raising heavily when you have a strong hand. Firstly, it will scare out the other players who may have played a speculative hand to try and get lucky. The last thing you want is 4 or 5 other people involved in the pot when you have a big pocket pair. Third, because you raised heavily, the other players have to pay more to stay in, which means you’ll be building a larger pot with a very good chance that you have the best hand pre-flop. If you expect to have the best hand AND can be confident your opponent’s will call with worse, it makes sense to raise up the pot to squeeze even more money out of your opponents before a flop is even dealt. A re-raise before the flop with hands that are probably better then the original raiser’s hands can really allow you to build a significant pot. If your stack consists of 100 big blinds then a decent sized re-raise (also know as a 3-bet) will comfortably allow you to keep betting later on in the hand with the best hand on the flop and turn, and then if you have planned it well you will be able to make a larger bet on the river, which hopefully your opponent will call now the value in the pot is so enticing. Whenever you’re playing poker, the main aim is winning your opponent’s stack, and an aggressive pre-flop strategy helps you achieve that. So many beginner players try and slow play their strong hands in an attempt to set a trap. Their thinking being something along these lines, “If I act weak, I can make my opponent bluff at the pot” or “If I bet they will just fold and I will win a small pot”. Although this does have it’s own merits in certain situations, for the most part it’s terrible logic, because by not betting you are not building a bigger pot with a big hand, and allowing your opponent to catch cards on the next street to suckout on you without having to pay for it. Aggression in poker doesn’t just refer to betting your strong hands for value or to protect your hand. Every poker player is getting dealt the same number of good hands over the course of their career, and if that’s all you played, you’d likely be a break even player at best. By adopting an aggressive pre-flop strategy, it allows you to set-up well-timed bluffs that are believable when executed at the right times. One of the big advantages of entering the pot with a raise, means you have the opportunity to continue betting on the flop, even when you happen to miss a piece of the board. This post flop aggression will increase your win rate significantly. Against one or two callers, many flops will have missed every player, and because you were the raiser before the flop, there is every reason for the other player’s to think you still have a strong hand on the flop, so a continuation bet works so effectively in these situations. Getting better reads and learning more about your opponent’s tendencies will allow you to play a more aggressive style of poker. Even when you are not involved in a hand, you’ll most likely get a good idea of how someone plays just by observing other players and putting them on a hand range. If the pot gets to showdown, you’ll be able to see if your were right and if you guessed right you will gain confidence giving you confidence in future pots you play against them. Not only can you just see the hands people play and the way they bet, in live poker you can also read some of the expressions people give – sometimes called “tells”. Developing an awareness of this isn’t easy. It’s not something you can’t learn overnight and will take some practise. But over time, the more poker you play, the better your awareness skills will become, and your poker will improve. Quite often, when I first sit down at a live cash game poker table, I tend to take the conservative route with medium strength hands, until I get a better feel for how the game is playing and what type of opponent playing styles I am up against. Obviously when you’re playing against unknown players your going to have to assume certain things, but you don’t want to make the mistake of assuming too much, because this can be very costly in No Limit Holdem, when one mistake can mean losing your entire stack. Observant poker players gain information on their opponents quicker, and therefore you can adopt a more aggressive playing style sooner rather then later (if it’s more profitable to do so), since you’ll know how your opponents will react to your bets.